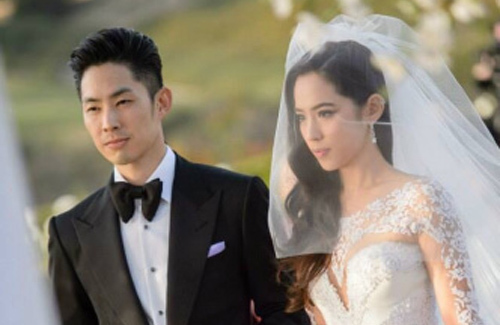 After their marriage in November 2013, Vanness Wu (吳建豪) and Singaporean heiress Arissa Cheo (石貞善) basked in a period of marital bliss and honeymooned in Greece. However, things took a drastic turn for the worse late last year, when the couple engaged in a sudden war of words over social media and unfollowed each other. Arissa had an Instagram caption that called Vanness out for being a “hypocrite” and being “fake” with his Christian faith. 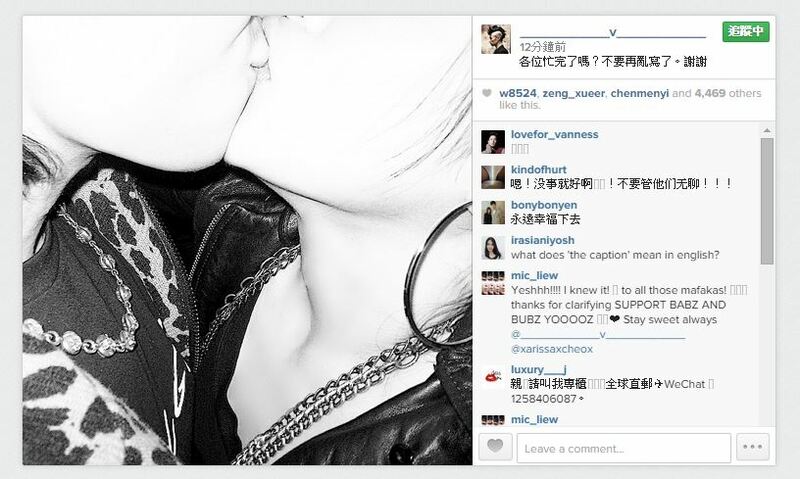 In retaliation, Vanness posted an Instagram caption indirectly addressed to Arissa, which said, “Watch your tongue!” Both subsequently de-activated their Instagram accounts for a period of time. Recently, Vanness posted a new Instagram caption which said, “Love is the driving force behind life”, which seems to suggest an intention to reconcile on his part. The couple finally worked out the knots in their marriage and reconciled, sharing a kissing photo of themselves yesterday. What are they, 12 years old? Anyways good on them for reconciling. Vanness has always been a Big Loser and a true hypocrite. Glad to see that his new bride saw through him………She will dump him before end of this year…..just watch for it. i must say this is quite entertaining. But honestly these two people are just immature. Sharing their domestic affair with the world???? This shows how disrespectful they are towards each other. She lives in a blessed life where money is not an issue. She is beautiful and healthy. What else does she want? Now as a wife, she should learn how to grow up. Think of how to use her wealth and media-attraction to help less fortunate people. As for him, he should clarify and understands the root causes of her unhappiness and solves them with her. Not surprise if they cannot last long if they still do not treat each other with respect and be mature. Marriage is for life. Is not a joke. Is not a party. This stage of marriage should be idyllic. They don’t even have any challenges beyond themselves. If they can’t even deal with themselves, what about other marriage challenges like work and financial woes, parenting kids (and their associated responsibilities and other worries), sick or aging parents etc to deal with? Agree they don’t have any other challenges beyond themselves. Arisaa is a billionaire heiress so she doesn’t nerd to work /doesn’t work much, vanness doesn’t film that much compared to tavia etc who film back to back…honestly compared to a lot of other job, bbeing an actor is relatively easier. For van ness, he is established, so good pay, he doesn’t film that much so lots of time off to rest and relax, less stress and danger compared to other professions. As for financial woes kids and aging parents, nothing $$$$% can’t fix just hire a nanny or domestic helper ! LMAO what a tool. As if people would know or speculate about their marriage if they hadn’t aired their dirty laundry on social media like two children. Holy macaroni, kids are getting married these days. Before they just had breakups and wisened up before tying the knot for gd. Good points Nomad! I think we all saw how they broke up and made up numerous times before they got married. But now see the same old cycle repeat in their marriage life. If they continue on like that then I really wonder if their marriage can last for life. washing dirty linen in public…hope these 2 mature. Lol. They were the ones who first told the public about everything. Kids. what’s with this kiss? this couple simply doesn’t grow up. they air dirty linen in public, now posting a pic of them kissing? they better seek a counsellor. Two dumb people who suits each other. Social media for Vaness and this chick mustve mean a place to air their dirty laundry in public. Exactly what I was thinking. They keep posting stuff on their own social media (instagram) but when people write about their stupid life on the basis of their social media, they get angry and tell people to mind their own business. They seem very rotten and arrogant. 2 fools…if either posts, reporter will ask…normal. if they don’t want to be questioned, then keep their lives private by not uploading pics. childish. one is a rich girl, the other is an entertainer. on and off relationship for so long…many would have thought they are in love to get married. apparently the guy is like a spoilt kid in front of reporters. Low moral n low self esteem people. Lord. They are both so damn dumb lol. People only started speculating about their marriage cause they made their disputes public. That makeup kiss pic is tasteless too. It literally just spells out “attention-seeking”. stupid of them to do all this. that pic about them kissing is so fake. want to kiss, quarrel or whatever, do so behind closed doors…these 2 are so childish.